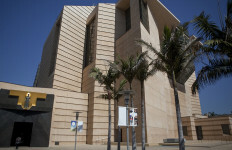 A judge heard arguments Tuesday but made no ruling in litigation brought by the San Diego heir of a Jewish art collector who alleges that the Thyssen-Bornemisza Museum in Spain is improperly holding onto a painting that was looted from his family almost 80 years ago by the Nazis. Camille Pissarro’s “Rue Saint-Honore: Afternoon, Rain Effect,” which depicts a 19th century Paris street scene and is valued at over $30 million, has been housed at the Thyssen-Bornemisza in Madrid for the past 25 years. During the daylong non-jury trial in Los Angeles federal court, attorneys for the Cassirer family and lawyers for the museum sparred over the provenance of the painting. U.S. District Judge John Walter gave no indication when he might issue his ruling. According to the 2005 lawsuit, the Nazis confiscated the painting from Lilly Cassirer, whose family owned a prominent art gallery in Berlin in the 1930s. As the woman tried to leave Germany, a Nazi official forced her to surrender the painting in exchange for the exit visa she needed. Her sister, who remained, was later killed in a Nazi death camp. During the war, the painting was sold by the Nazis to an anonymous buyer, and the Cassirer family believed it was lost until a family friend saw it hanging at the museum 18 years ago. Court documents show that Swiss industrialist Baron Hans Heinrich Thyssen-Bornemisza purchased the painting in 1976 from a St. Louis art collector, and hung it in his bedroom. Years later, Spain bought Thyssen-Bornemisza’s collection to hang at his namesake museum, which has repeatedly refused to return the painting to the Cassirer family, according to the lawsuit. Five years after Claude Cassirer, Lilly’s grandson — a part-time resident of Coronado — filed suit, a judge dismissed the case. That decision was overturned in 2013 by a federal appeals court, setting the stage for Tuesday’s trial. Since Claude has died, his 64-year-old son, David Cassirer, has become the plaintiff, along with the United Jewish Federation of San Diego County. The Cassirer family originally filed the lawsuit following a Supreme Court decision allowing U.S. citizens to sue foreign governments in federal court over art plundered by the the Nazis. Walter will decide whether the museum can keep the piece or whether the Cassirer family is its rightful owner. Plaintiffs’ attorney David Boies, who represented Al Gore in the fight over the 2000 presidential election and argued on behalf of gay marriage before the Supreme Court, suggested that the baron bought the painting in “bad faith,” knowing it had been stolen or willfully ignoring research that could have illuminated the fraught history of the piece. In a testy exchange with author and researcher Lynn Nicholas, one of the museum’s art experts, Boies attempted to show that the baron tried to “disguise” where he bought the painting in an effort to conceal its provenance. Thyssen-Bornemisza’s attorney, Thaddeus J. Stauber, argued that there was no evidence that the baron acquired the Pissarro painting in anything but good faith in 1976 and the foundation lawfully took possession of it 17 years later.